Cancer physician Dr. Eugenio Galindo offers a closer look at his hematology and oncology, internal medicine, and medical oncology specialties. MISSION, TEXAS, USA, April 8, 2019 /EINPresswire.com/ -- Dr. Eugenio Galindo is a specialist doctor primarily located in Edinburg, Texas. His specialties include hematology and oncology, internal medicine, and medical oncology. 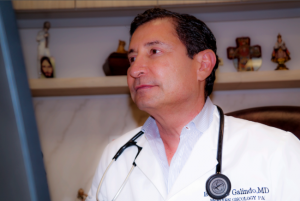 Here, Dr. Galindo offers an insight into his work as a highly respected oncologist serving the Rio Grande Valley and surrounding areas. "I specialize in hematology and oncology, internal medicine, and medical oncology," explains Dr. Galindo. "An oncologist is a specialist physician who focuses on the diagnosis and subsequent treatment of different cancers," he adds. An oncology physician has, he says, an extensive knowledge of the different signs and symptoms of cancer, plus the various methods of treatment. "Oncologists such as myself typically diagnose cancer through methods such as biopsy, ultrasound, blood tests, and endoscopy, as well as various forms of nuclear medicine," adds Dr. Galindo, "before treating the disease via surgery, radiotherapy, chemotherapy, hormone therapy, or, in some cases, antibody treatments." Of internal medicine, Dr. Galindo goes on to explain that a so-called 'internist' is a physician focused on the diagnosis and treatment of various acute and chronic conditions which affect the adult population. "Internal medicine doctors often act as primary care physicians for adult patients," he explains, "responsible for treating a range of illnesses and other complaints which, mostly, otherwise do not require specialist intervention." Internists also work to help patients maintain optimal health and treat often seasonal conditions such as the common cold and flu, as well as chronic diseases, such as diabetes, according to Dr. Galindo. Lastly, he touches on medical oncology. "Think of an oncologist," Dr. Eugenio Galindo explains, "as a primary physician for cancer care." Following diagnosis, cancer patients will meet regularly with an oncologist, according to the expert, to explore and manage their treatment options and condition. Medical oncologists are, he says, often highly knowledgeable in a variety of different types of cancer treatment, capable of recommending the best method or methods of care for the type and stage of cancer which a patient is facing. A medical oncologist may also refer patients to additional specialists throughout their care, but will always be that patient's 'home base' for questions and support, according to Dr. Galindo. "Furthermore, it should also be noted," he adds, wrapping up, "that medical oncologists typically deal primarily with solid tumors, with hematologists instead specializing in blood cancers, for example, such as leukemia."